When I heard that archivist Philippe Goddin was writing a biography about Georges Remi, aka. Hergé, my first thought was: What can he possibly add to the story that has not already been covered in the previous biographies? Hergé is probably the most extensively covered comics artist, both in terms of scholarly and popular publications. Before Hergé, Lignes de vie came out in late 2007, he was already served by no less than four biographies of great repute — Thierry Smolderen and Pierre Sterckx’ Hergé, Portrait biographique (1988), Huibert van Opstal’s Essay RG (1994), Pierre Assouline’s Hergé (1996) and Benoît Peeters’ Hergé, Fils de Tintin (2002). Add to this Numa Sadoul’s seminal interview book, Tintin et moi (1975), published correspondence, and many other publications dealing with the life of Tintin’s creator. So what could Goddin possibly add? Having read only a fraction of the literature, I hesitate to make any sweeping statements, but my sense is on the one hand not much, but nevertheless quite a lot. Goddin not only knew Hergé in his later years, he has also been the archivist of his substantial Nachlass ever since and is evidently intimately familiar with the documentation. Additionally, he seems to have a direct line to the cartoonist’s widow, Fanny Rodwell, who along with her husband Nick keeps a tight hold on the estate — a privilege extended only to a few scholars. Knowing this, one would expect his book to be the authorised-in-the-sense-of-sanitised story, but it does not read that way. Though clearly driven by an great admiration for Hergé, it does not go easy on its subject — the problematic war years may not be given as much space as they did in Assouline’s biography (which was also authorised by the estate), or even in Peeters’ book, but neither is it given the short shrift. Offhand, I did not notice much new in this section, but it presents very well the facts as they are known and leaves it up to the reader to judge, should he or she so wish. And that is basically the book’s virtue, if also its weakness — it relates the facts, sometimes at rather torturous length, without much in the way of interpretation on the part of the author. What else could be expected from the editor of the insanely inclusive and largely unnecessary complete works series Hergé, Chronologie d’une oeuvre? This may discourage some general readers, but for people interested in Hergé’s life, who may already have read some of the earlier biographies, it is a treasure trove of new information — most of it rather minor, but nevertheless enriching. A life is frequently in the details. But there is actually another, equally important reason it works well, and makes for a rather gripping read, even to people beyond the choir, I should think. And that is the way it is structured around Hergé’s own letters and other writings about his life. He is a compelling writer, who despite occasionally flirting with the pathetic keeps his focus on the essentials in his life. One gets the impression of a deeply inquisitive — if also at times self-delusional and insufferable — man, and it is fascinating in this way to get a glimpse into his ongoing attempts at putting into words the things that trouble him in life. It should come as no news that he was a somewhat brooding, at times outright depressive, person, at least in private. This is evident from any of the sources. What is perhaps lacking here, as well as in everything else I have read about him, is a more satisfying account of the charming, confident individual he must also have been at times. The melancholy side of his personality evidently holds greater fascination and was no doubt determining for much of his life, but one still wonders whether the humorous, inventive and creative aspects of his personality — qualities essential to Tintin — have not been neglected somewhat. Mind you, this is not even remotely as problematic as the treatment that his great contemporary, Charles M. Schulz, was given in David Michaelis’ engrossing, but controversial and deeply problematic recent biography, but Goddin’s book still lacks a certain symmetry. Aided by the documents, Goddin manages at least to convey Hergé’s determination, and tenacity — tending towards stubbornness — as a businessman. He for example narrates the problematic and eventually acrimonious relationship with Bernard Thiéry, his agent, in more detail than I believe even Assouline did. On the other hand, his treatment of what was perhaps Hergé’s most important business partnership — with the publisher of the Tintin magazine Raymond Leblanc — is surprisingly slight and one-sided. Leblanc is almost exclusively seen from Hergé’s increasingly frustrated and disapproving viewpoint, which makes their at times almost estranging disagreements harder fully to understand. By contrast, Peeters managed to deliver a more rounded portrait of Leblanc and the troubled relationship between the two men. As could perhaps be expected from someone with three decades of familiarity with the Hergé archives, Goddin provides us with greater insight into the personal life of his subject than anyone before him. We get what seems pretty much all the available — at times rather sordid — details of his affairs, and his at times heartbreaking relationship with his first wife Germaine. One episode Goddin manages to elucidate in a revelatory way are the events behind the scenes of Hergé’s first major absence from his strip (the first of many), in the middle of the serialisation of Prisoners of the Sun, June-August of 1947, an interruption that lasted almost two months. Previously this has been somewhat vaguely described as the result of a serious bout of depression, but Goddin reveals how a major crisis between him and Germaine was taking place that summer, triggered by advances he had made towards a young girl who had accompanied them on holiday that May. A typical mid-life crisis in bloom, in other words, that nuances our understanding of his somewhat mysterious depressions and ultimately presents him in a more mundane, but also human light. What I miss most from the book is a deeper engagement with Hergé’s work, something Peeters did extremely well (as a comics writer and scholar, it obviously came to him naturally). Although Goddin loyally follows the publication history of the comics and at times dips into the context of their creation, Tintin remains somewhat divorced from the Hergé we meet here. The problem is not as pronounced as in Assouline’s book, but still noticeable. The reason presumably lies in Goddin’s method: to engage with the work and see it in the context of the life would entail a level of interpretation that he is unwilling to impose on the material. Still, one could have hoped for greater insights on Hergé’s approach to the page and to story, his way of running his studio, and his thoughts about his work as such. Goddin must surely know more about this than he lets on — and probably more than anyone else — and it detracts from the book that he does not share this knowledge. Other frustrations include the lack of a proper bibliography, a rather unsatisfying referencing style, and annoyingly uninformative image labels. Nevertheless, Hergé, Lignes de vie is an invaluable addition to the literature on Hergé. It may not be as well written as Assouline’s or Peeters’ volumes, but holds its own thanks to Goddin’s passion for his subject, and especially Hergé’s own words. It is indispensable for students of Hergé’s life and work, the closest we have gotten to a definitive biography so far. It would however depend on the patience for detail of the person in question whether I would recommend it as the first or second — after Peeters — place to go for the general reader wanting to know more about the man behind Tintin. Philippe Goddin, Hergé, Lignes de vie, Éditions de Moulinsart, 2007. 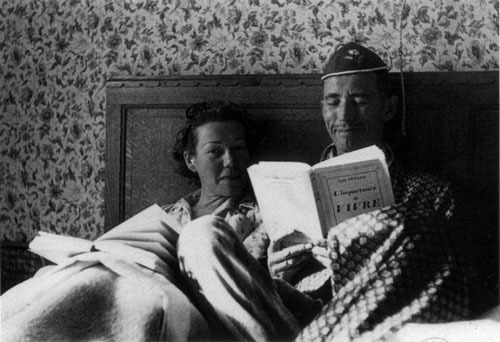 The photo is from 1944 and shows Germaine and Georges on holiday, the illustration is by T. Thorhauge. Read also our appreciation/conversation on Tintin and look at our compilation of homages to Hergé made on the occasion of his centenary in 2007.